Add a touch of fun and charm to your paper craft creations with the Paw-fect Pooches dies! When paired with the coordinating cling stamps, creating your choice of dog themed dimensional or flat laying embellishments is quick and easywhether it be borders filled with amusing antics, a bright eyed pooch bringing playful greetings or a bone shaped treat ready to display a sentiment! And, what could be more amusing than die cut paw prints adorning scrapbook pages of your furry friend, or even paw print shaped note cards! These dies are part of the Pampered Pooch Collection and pair with the Paw-fect Pooches Cling Stamp Set. Approximate Image Sizes: 1. Large Bone Shaped Treat: 2.5" x 1.25", 2. Midsized Bone Shaped Treat: 2.0" x 1.0", 3. Small Bone Shaped Treat: 1.75" x .5", 4. Bright Eyed Pooch Pal: 2.5" x 2.5", 5. Bright Eyed Pooch Pal: 2.5" x 2.5", 6. Detailed Large Paw Print: 2.0" x 2.0", 7. Solid Large Paw Print: 2.5" x 2.25", 8. Detailed Small Paw Print: 1.0" x 1.0", 9. Solid Small Paw Print: 1.25" x 1.25". This is a large hot dog die set consisting of the bun, sausage, and condiment "squiggle". The assembled hot dog measures approximately 4.2" x 1.125". Our Frantic Stamper Precision Dies work in most consumer table top die cutting machines such as the Press Boss, Cuttlebug, Big Shot, vagabond, Boss Cut, and Grand Calibur. Frantic Stamper Die - Labrador Retriever. Here's a cute dog for you. Cut him from different colors to make a chocolate lab, golden lab or black lab. He measures 1.2" x 1.25". 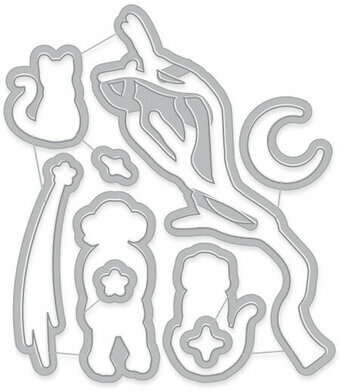 Die D-Lites Dog Club Etched Dies set includes four fun dog silhouettes. Spellbinders Die D-Lites cut, emboss and stencil with a single die template. Approximate Sizes: Tiny Dog: 1.00 x 1.10 in. 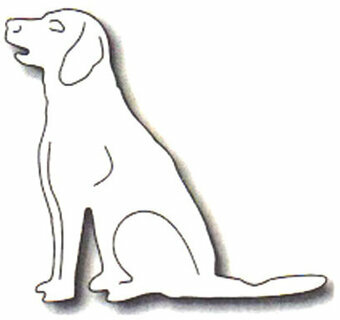 2.50 x 2.70 cm, Harry Small Dog: 1.35 x 1.11 in. 3.40 x 2.80 cm, Wide Dog: 2.45 x 1.31 in. 6.20 x 3.40 cm, Harry Dog: 2.50 x 2.01 in. 6.30 x 5.10 cm. Creative Expressions Necessities Collection Sweet Dreams Little One. An elegant collection of high quality steel dies designed to co-ordinate with each other. These cute baby animals are a great addition to scrapbook layouts, and would be lovely on baby cards as well. Designed by Sue Wilson. Includes 6 craft dies. Size: 2 x 1.8 inches. Meet Sweet Pea the Yorkshire (1.25" x 1.75"), Max the terrier (1.25" x 1.75") and Frankie the dachshund (1.375" x 1.9"). Made in the USA with 100% stainless steel. Our Frantic Stamper Precision Dies work in most consumer table top die cutting machines such as the Cuttlebug, Big Shot, Vaggabond, Boss Cut, and Grand Calibur. Some dies may require the use of a metal shim depending on your machine. Every dog has its day! With their own unique personalities, Sizzix Framelits Crazy Dogs by Tim Holtz are the pawfect pairing for Stampers Anonymous Crazy Dogs Cling Mount Stamps (CMS271 - sold separately), cutting right up to the stamped edge. Fun for layering, this Framelits die set showcases the bold and edgy style of Tim Holtz. The Framelits dies in this set are compatible with the BIGkick, Big Shot and Vagabond machines (used with a pair of Cutting Pads and the machine's included Platform; when using the Essentials Platform or Solo Platform & Shim, the Extended Adapter or Solo Adapter is required). All items sold separately. Craft dies featuring dogs and puppies. With Hero Arts Frame Cuts, that perfectly match our coordinating stamps, you can add architectural form and tidy framing to your cardmaking, stamping projects, and more. They are of solid metal construction with a sharp and durable cutting edge. Ideally designed to work with most papers and other thin materials. Universally compatible, they make it easy to align around your stamped images.